Choosing the right personal injury attorney is essential. Jim Mills is a veteran, board-certified trial lawyer and the founder of The Mills Law Firm. 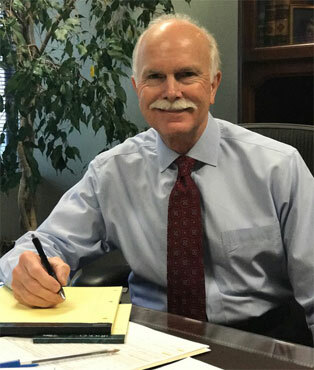 With more than 40 years of experience in both personal injury disputes and commercial and business litigation, Jim combines a personal touch for clients with years of experience to right wrongs inside and outside of the courtroom. Since founding The Mills Law Firm in 1985, he has built a multifaceted practice that represents people and companies in a broad variety of legal issues, making him an excellent choice to handle your case. A graduate of Auburn University, Jim received his law degree from Louisiana State University and began his career as an Assistant District Attorney in New Orleans, where he prosecuted all major felony offenses. He then worked as an associate with a prominent insurance defense firm before moving to Dallas. In Dallas, Jim developed an extensive knowledge of the insurance industry as he served as a senior claims adjuster for a major national insurance company. He went on to serve as the head of the product liability department for a major plaintiff personal injury firm. This has enabled Jim to draw from his understanding of the tactics employed by “the other side” to better represent clients in personal injury cases. Jim has been board certified by the Texas State Board of Legal Specialization in Personal Injury Trial Law since 1986 and in Civil Trial Law since 1987. He holds the highest peer ratings from Martindale-Hubbell for legal ability (A) and professional ethics (V). In addition to being licensed in Texas and Louisiana, he is admitted to practice before the Federal Court of the Northern, Eastern, Southern and Western Districts of Texas as well as the U.S. District Court of Appeals of the Fifth Circuit. Jim is a member of the Dallas Bar Association, Dallas Trial Lawyers Association, Texas Trial Lawyers Association, a Fellow of the College of the State Bar of Texas, and the American Association for Justice. From 2004-2006 he served as a director of the State Bar of Texas Insurance Trust and as chairman of the District 6A Grievance Committee of the State Bar of Texas. This commitment to service, both personally and professionally, makes Jim Mills the right choice to be your personal injury advocate in the courtroom. Through diligent discovery, precise use of expert witnesses and sound legal strategy, Jim has achieved fair settlements and favorable verdicts for his clients.